What is the difference between an Industrial Chiller and a Commercial or HVAC (air-conditioning) Chiller? Advantage manufacturers industrial chillers that provide value and features that may not be available from Commercial HVAC chiller manufactures. HVAC chillers are primarily used for air-conditioning…comfort cooling. Some Commercial HVAC chiller manufacturers offer features that are a standard on industrial chillers but are offered only as an optional add on to their products and at a significantly increased cost. If the buyer doesn’t know and understand the importance of these features they are often not offered. Look here for specifications and pricing on Industrial Chillers. Shown on the left is a Titan Series Industial Chiller by Advantage. Shown on the right is a typical Commerical/HVAC chiller. 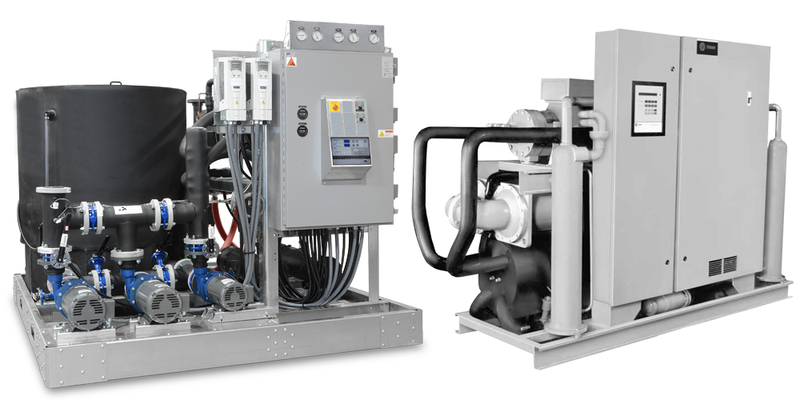 Industrial chillers have independent water and refrigeration circuits. Most HVAC chillers have independent refrigeration circuits, but not independent water circuits. HVAC chillers often share a multi-circuit evaporator. If the evaporator fails on an HVAC chiller, the entire chiller is down causing the entire process to shut down. With independent evaporators on industrial chillers, if one evaporator fails there is still a minimum of 50% capacity built into the design for back-up purposes. HVAC chiller suppliers offer only the chiller and often aren’t able to provide reservoirs, pumping systems and controls. Advantage industrial chillers are available with integral pumps, tanks and controls in capacities up to and exceeding 200-tons of capacity. This integrated package keeps installation costs down, provides a single source of system responsibility and minimizes the foot print required. Industrial chillers include water manifolds with service valves for the evaporator and condenser (water cooled products) as standard. Most HVAC chillers do not include these features and they must be installed in the field by the installing contractor or if not installed maintenance and repair is often more costly. On industrial water-cooled chillers, condenser water regulating valves are included and are pre-piped at the factory. Most HVAC chillers provide condenser water regulating valves as an option to be installed in the field, adding more labor and material costs. Industrial chillers include a labor warranty as standard. Most HVAC chiller manufactures provide a labor warranty at an additional cost. Industrial chiller manufacturers provide start-up and training for central chillers and pumping systems. Most HVAC chiller manufactures will provide start-up and training at an additional cost and only focus on the chiller and not the entire system. HVAC chillers are often sold through distributors or agents that don’t understand your process and aren’t able to help you decide the best chiller capacity or chiller configuration to meet your needs without hiring an expensive consulting engineering firm. Industrial chiller manufactures employ skilled and experienced application staff to guide you through the selection and installation process. Industrial chillers are designed to operate in all weather conditions while HVAC chillers are often idle in the winter since air-conditioning is not required. Industrial chillers have specific integrated controls that allow them to operate in both hot and very cold weather conditions. Industrial chillers can be serviced by a wide range of technicians while HVAC chillers are often limited to service providers that are brand specific. Most industrial chiller manufactures have readily available support personnel available for phone consultation long after the warranty period expires while HVAC chiller support can be difficult and expensive once the warranty ends.